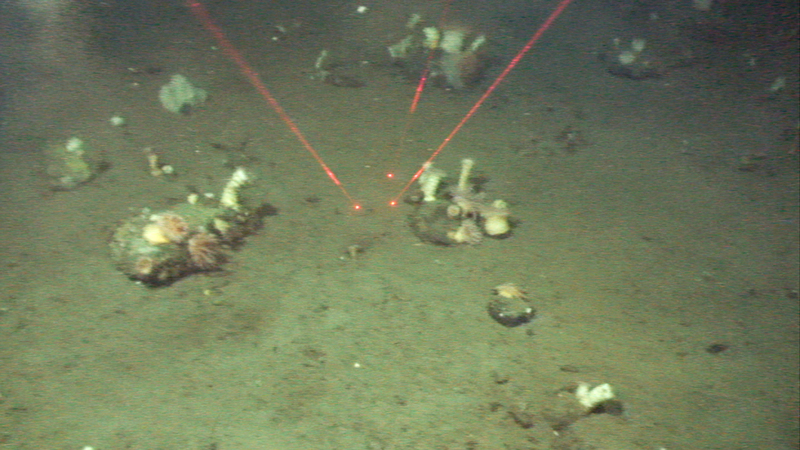 Cruise diary: Approximately 120 sea miles north of Vardø (coast of Finnmark), at depths between 210-350 meters, the MAREANO survey recorded a muddy seabed with cobbles and boulders that were covered by sea anemones. Anemones vary in colour and size and are recognized by their tentacles used for catching their food. The prey is caught by the tentacles, paralyzed by stinging nematocysts, and carried to the mouth. Large sea anemones can capture fish, but smaller crustaceans are also caught. 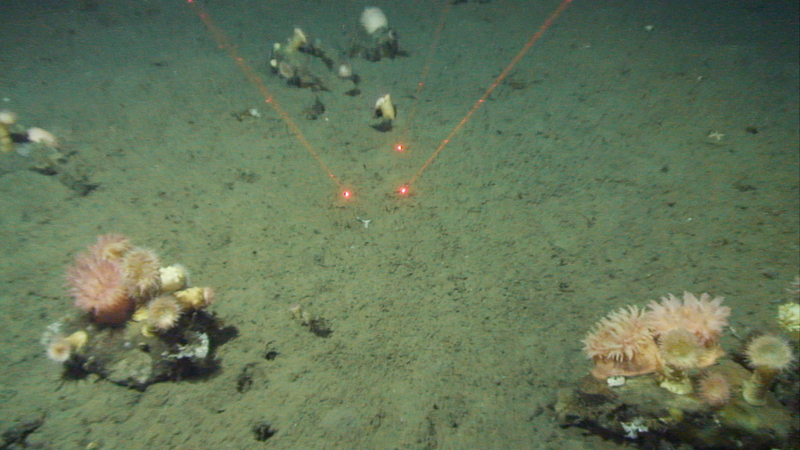 MAREANO investigating sea anemones attached to cobbles and boulders at the seabed. Sea anemones not only live attached to cobbles and boulders, some species are adapted to “float” on the soft mud. One of these species, Liponema multicornis, was recorded in relatively high numbers at some of the video transects. This sea anemone can have up to 900 short tentacles. 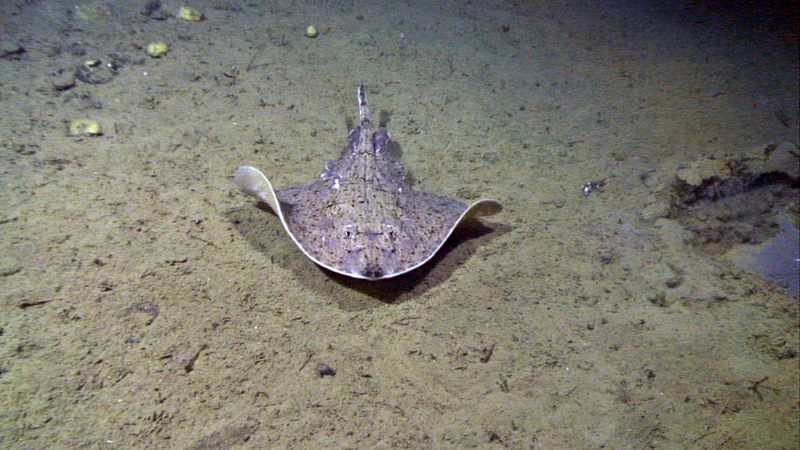 This species is easily fragmented by a trawl or dredge, but by video it is easy to get an idea of their abundance and distribution. Other studies show that the prawn Pandalus borealis is using this sea anemone as a shelter and for protection. Krill feed on amphipods living within the tentacles of the sea anemones. The same studies suggest that frequently bottom trawling might reduce the number of Liponema multicornis and thus the role it has in the benthic community as a shelter and foraging habitat. The sea anemone Liponema multicornis sitting at the sediment surface spreading out its hundreds of tentacles in order to capture food. In other areas covered by MAREANO on this survey, Pandalus borealis was frequently observed standing on the sea bed and all looking in the same directions with the head and antennas lifted high above the sediment surface. This and other prawns are prey for fish such as cod. 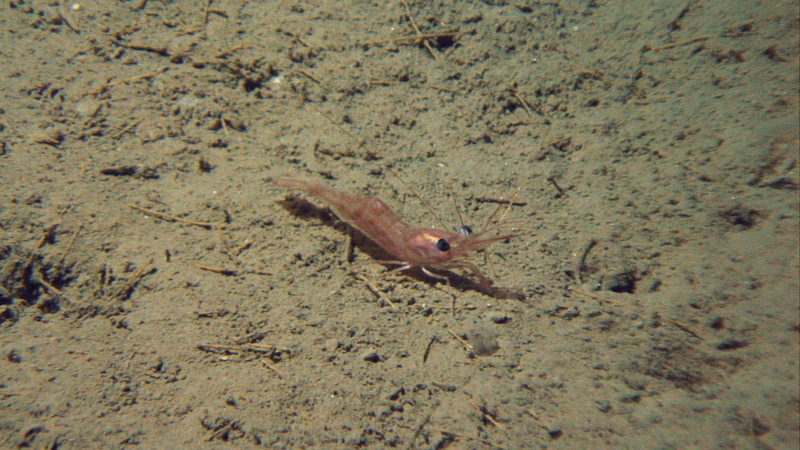 The shrimp Pandalus borealis standing on the seabed. Cod, haddock, redfish, flatfish (Greenland halibut, long rough dab, etc) and skates were also seen. A skate between the legs of the video-rig (one foot seen in the right corner). The Barents Sea is a productive area holding a rich species diversity within, on and above the sediment surface. 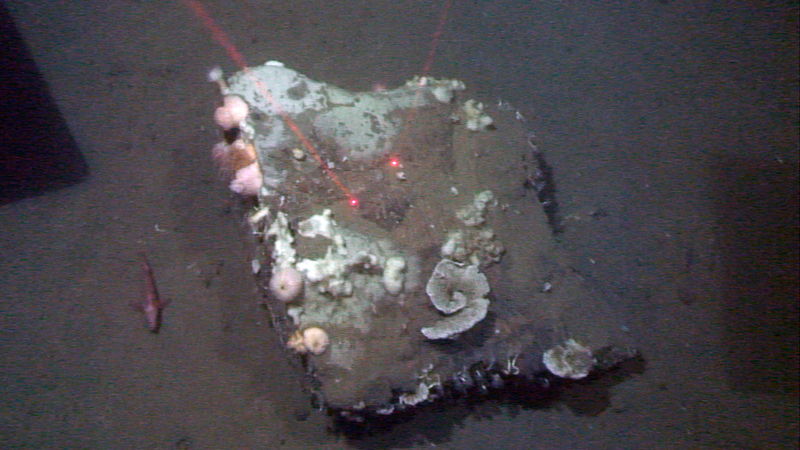 The video observations have revealed a seabed full of holes, burrows, and channels made by species still to be identified. We are expecting to find answers to some of our questions by studying the animals in our sediment samples, taken by traditional sampling with the grab, trawl and sledge. Together with the pockmarks and iceberg plough marks, the Barents Sea south east is a heterogeneous geological landscape. Valérie Bellec, Reidulv Bøe, Stepan Boitsov, Sigrid Elvenes, Heidi Gabrielsen, Genoveva Gonzales-Mirelis, Torjus Haukvik, Gjertrud Jensen, Lis Jørgensen, Hannu Koponen, Graham Oliver, Eva-Marie Skulstad, Anne Helene Tandberg, Andrey Voronkov.